The son of Odin and heir to the the throne of Asgard, brashly defies his father's wishes and is banished to Earth to learn humility. Will the Thunder God regain his mythical hammer, Mjolnir, and return to his homeworld in time to save all of Asgard? 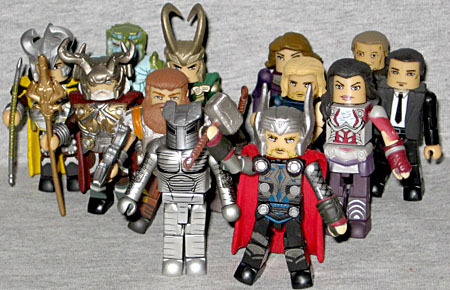 Thor is a great example of what I like about the Minimate style - detail through paint with some additional pieces to accent or provide "flourish." What's remarkable is that AA did go the paint route because they've definitely been slanting increasingly sculptural and certainly this chest armor has that level of detail they tend to sculpt, much like last year's Iron Man 2 stuff. Fortunately though, the sculpting is relegated to just a "skirt" that extends the armor down over the waist, the cape and new hand/wrist-guards for the arms. 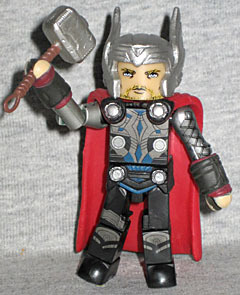 Thor gets a pretty accurate likeness to Chris Hemsworth and, unlike the other Thor movie figures, comes with a helmet and a hair piece so you can have either look, as per your preference. As a second accessory there is the ubiquitous Mjolnir hammer, detailed to look just as it does as in the movie, which means a little bit more carving detail than the modern comics and no oath written on it anywhere. Created as a powerful weapon, the dread Destroyer was locked away for generations by Odin himself. Guarded and concealed for years, the Destroyer appears on Earth to do battle with an exiled Thor in hopes of preventing his return to Asgard. Destroyer is the big cool "monster" of the film and an exciting throwback to the monster-robots of '60s sci-fi. This guy looks pretty accurate to the film incarnation, which in turn looks pretty accurate to the comics version. I really like how they handled his trademark Kirby-brow: it's a simple dome piece with the brow sculpted on; that whole piece then plugs into the hole on the top of the head. It's a great, subtle and simple solution that avoids the awkwardness of those slip-on heads or that of a new head sculpt entirely. He also utilizes the "generation 2" bulked-up chest piece for the torso, which has better musculature style and even partially overlaps the shoulders (in a good way). Overall this is a pretty good figure. 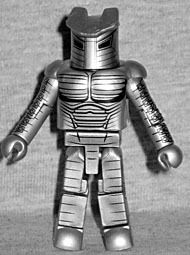 It does lose a couple points because the paint is more gray than silver, but the real problem is that he is the same height as all other Minimates. Destroyer is at least 8 to 10 feet tall and as such, this figure really needs the "duck feet" and "Cylon torso extender" to add at least a little height to him. Honestly, I think an alternate head cast in translucent orange painted to have "eye ports" open would have been great - sort of a "fire mode" version.